BJJ Globetrotters | the pitman cup. It was a clear black night, a clear white moon, wait, that’s something else! It was actually a crisp Saturday afternoon in Riccarton, November 22, 2014. Jason Koster, the man behind the amazing Survivor Series event that I wrote about a while back, had put together a submission only, open weight grappling event that was to raise money and awareness for Lifeline and named after our brother and fallen comrade, Jonny Pitman. There were 32 people entered in this, both male and female, ages varied from teenagers to “mature” adults. There were people from the judo community, jiu jitsu community and also the mma and wrestling families had representation. As it was a crossover event, Jason decided to run it without any leglocks so there would be limited injuries, the fights would however start from the feet. It was billed as the below. We had some questions from “takedown challenged” few so Jason decided best to demonstrate what was legal and what was not. I was quickly “volunteered” to be the uke or throwing dummy here and I was fine with that, I mean it was only a demo? Well, queue me letting him set up and then WU-TANG! Jase executed a massive uchi mata (hip throw) which sent me flying into the tatami’s at a great rate of knots and also fused my spine into my sternum and somehow swallowed my testicles into the mix like and internal Voltron. I stood up though, like nothing had happened only because everyone was watching and I honestly probably bounced! We then went on to do a few more throws which were standard wrestling shots and I was now aware that we were demonstrating with prison rules, I was now ready to breakfall although I am pretty sure I went and cried in the car afterwards! At least now everyone knew what the score was! With two mats set up, we had a really good system running through. The draw was randomly generated by a computer program so as not to incur any bias from any people. There were great styles matched up, we had referees from Groundworx BJJ namely Hayden Wilson, Jason Branks and myself. The list of entrants I could find are below although there were more I believe, Moira Koster was in this as well and did amazing! The first big thing I noticed in my matches was the confidence the judo players had in standing, I know this is stating the obvious but knowing this part of the game so well is a huge advantage in grappling, even with no points on offer for a takedown, it is a good thing if you wind up on the ground on top position and/or in control of the manner in which the fight goes from standing to ground. Sam Belkin is a master of this. 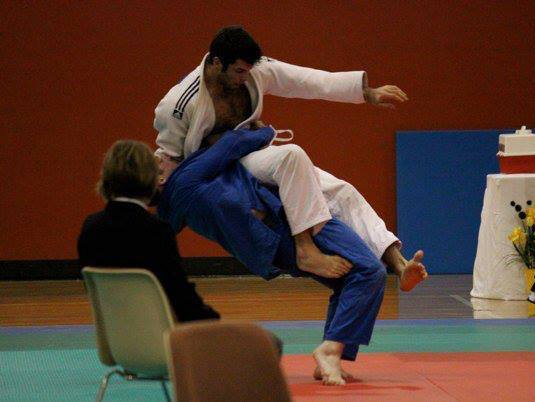 He is a Commonwealth Games bronze medalist for wrestling and on top of this, he was also a purple belt in bjj at this time and he also weighed on the lieu side of 100kg so he is a force to be reckoned with! In saying this, he is an absolute gentleman when taking an opponent down, in full control of their flight. The only time there was a hard fall was when he was up against Thorben – another +100kg fighter and a judo black belt and in the takedown, they take up a large area of floor space and unfortunately Thorben hit the wooden floor on the way down injuring his shoulder. I have placed a link at the very end of this article to some videos which show a few of these matches and this takedown in particular! Submission only can also have drawbacks. I am not a big fan of the kimura armlock for a submission. I use it all the time to control and sweep but I find it so fast and painful when it is applied and it is so tough to tell if it is actually “on” to the point where the arm can break. I had a match on my mats with a blue belt from Axis and a blue belt from Strikeforce. They were similar weights and it was a very good solid match with advantages going back and forth before the Axis player got his opponent in a deep kimura. When the pressure was applied, the other player moved but not enough and could not escape, nor would he tap! I let the match continue but the concern on the face of the Axis player who was applying the lock, showed me it was as deep as it looked. I warned both players that if he did not escape or submit in the next few seconds I would call the match in the Axis players favor. I was so concerned that I called the match. Holy moly, it was not well received by the spectators! I broke the cardinal rule of refereeing and spoke with the crowd, never a good thing as there will only always be one happy team! After talking to the coaches from each team and the players, they agreed to carry on the match from the same position. In the end I think we got about another 80 seconds of action before the Axis player submitted him. I spoke to the coaches again at the end and they were both happy with how it was handled and agreed that I stopped the match at a good time! Since this time though, I learnt that you make a decision at the time and stick to it. I have stopped matches since then and am very clear about what I am doing and why. We are there to ensure fighters safety, not explain our actions after every call. I did miss a lot of the matches as I was running one mat the whole time but the semi final between Moira and Cam Steer was a great one. Cam showed immense respect for Moira’s take down game by sitting into guard, we can all laugh that he did it but we all knew very well that she was going to put him onto the mats anyway, this version saved Cam any pain and aerial antics! We had white belts up to purple belts in bjj and black belts in judo and traditional jiu jitsu on the mats and everyone was taking it all out there, even the ladies vs the men showed the true heart of the ladies. Being open weight means the smaller person is always going to get squashed at some point but there was no quitting here, only when the submission was truly applied (except once lol) did we have people tapping. I was in awe of the skill of the lower grades and the higher grades, it is great to see the playing field level out like this these days! All of the matches were amazing, it was this event when I first started to see how fast jiu jitsu and grappling was evolving in Christchurch, just the speed now that people are learning, I think as coaches we have changed a lot in the way we teach in that the concepts are shown as a part of the techniques and learnt in conjunction with them, the game is forever getting better and so are the students! I actually started writing this piece a while back but something happened which made this much harder to write. We are all amazing at helping each other, I cannot honestly say I have been in another team environment such as jiu jitsu/grappling where everyone wants to beat each other so badly but we are all there to help each out with anything. What I think is the real issue is we are not always helping ourselves get what we need in the best way. It’s great to help other people but we need to concentrate on the positive aspects of our own games, in grappling or in life. There are always ups and downs but the ground is always there to catch us if we fall, we know there are so many people willing to help us get back up but we need to be the ones reaching out our hands. The footage link is here. Please note, once again I have linked in videos from Graeme Spinks’ Pro Judo channel, all I did was save them to a playlist! I highly recommend following his page and checking out all the footage saved in there, an actual goldmine for the grappling community!